You’ve had the dream. It’s set to the song of cicadas with lush green trees and grass, family members laughing and playing, and a pervading spirit of fun and adventure. We’ve all had these sorts of vacation reveries, whether set in the hills of Italy, the wide-open skies of Idaho, or the more locally gorgeous terrain of Central Texas. Turning these dreams into a reality might be easier than you think. Let Leland’s Cabins help. What holds most of us back when considering a log-cabin purchase is money. How do we find the means to pay for a prefab log cabin? How do we structure a loan to cover the costs of a Texas log cabin, set in the woods or otherwise? How do we finance a modular cabin compared to a traditional home or second home? Start by getting to know what’s out there. 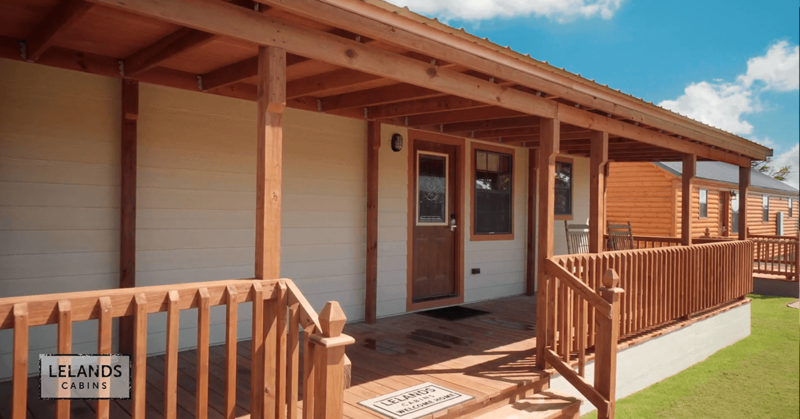 There are plenty of manufactured cabins in Texas to consider, but we hope you’ll recognize the quality and craftsmanship that go into every Leland’s cabin. Choose from one of our nine log-cabin models and find the floor plan and style that fits best with your lifestyle and needs. If you’re looking for a getaway for friends and family, check out the Settlement Harbor. When you choose the two-bedroom option, it features two bathrooms as well. With this floor plan, we’re doing our little part to ensure world peace — nobody is banging on doors waiting for the shower, everybody has enough privacy, and the whole cabin can sleep well at night knowing they won’t be prowling the dark in search of the bathroom. It’s a perfect layout for hosting and entertaining. At 704 square feet, this cabin offers spacious comfort without beating up the wallet. Priced at $63,314, the Settlement Harbor offers years of precious memory-making. And since our cabins are built to last, we expect the grandkids to treasure it as well. And Settlement Harbor is only one example of what Leland’s has to offer. You can choose one of our larger prefab log cabins like The Lodge to accommodate more guests, or select one of our leaner models like the Chisholm Trail for a quieter getaway. As with all real estate investments, location matters. When you’re considering the Texas log cabin of your dreams, think about where you want it to be. Do you envision placing it on a parcel of land near a lake, so you can get in as much fishing time as possible when you’re off from work? Or do you want it on the top of a hill to catch spectacular sunrises and sunsets? These are things to consider as you tally up the costs of turning the dream into a reality. When you’re ready to look at financing options, banks can help you with purchasing both the land for your cabin as well as the cabin itself. And when you choose a Leland’s cabin, we’re clear about pricing so that you know exactly what the home will cost. This way, when you’re ready to apply for a bank quote for how much they’d be willing to lend you, you’re working with clear, reliable numbers. As you’re factoring in interest rates and fees along with actual cabin expense, you’ll get a clearer picture of what the total purchase will be and how you’ll finance it. Going with Texas-built modular cabins like Leland’s homes lets you know the costs — clear and up front. No hidden surprises. This is great for setting up financing with banks. But keep in mind that going modular doesn’t have to mean rigidity. Our team of designers is willing to work with you to build the best cabin possible, matching what you have in your head with the space you ultimately walk through. Want another closet? We can add that. Want to move a window or door? We can do that too. Prefer a bank of windows from one cabin model? We can incorporate it into another. Want different floors than you’ve seen in a friend’s cabin? We can show you other options. At Leland’s, we believe in flexibility, so our floor plans can be modified to suit your tastes. Relationships matter. It’s how Leland’s grew from a fledgling family business to one of the finest Texas log cabin builders around. And we carry this approach to every customer who comes through our doors, sitting down with you to hear what you’re interested in and how we can match our cabins to your ideas. When it comes to financing, we have developed great relationships with local banks that offer construction loans for locations around Central Texas. For example, if you’ve decided on one of our cabins priced under $50,000 and you have good credit with a score of 620 or better, a signature loan offers a good financing option. Sit down with us and talk about financing opportunities. We want to help you choose Leland’s Cabins when you’re ready to make your log-cabin dreams a reality. As you research all the steps in the journey, we hope your path leads you to our door — so you can walk through each of our cabin models and imagine yourself calling one of them home. At our log-cabin showroom in Grandview, we have family and friends ready to work with you. The only thing you need to bring is your imagination.